As the Calais jungle was set to be razed in October 2016, there were over 1900 unaccompanied minors stranded there – many of whom had a legal case to enter the UK. Sue Clayton fought to get these children recognised and their cases heard. But with the camp soon to go up in flames, could she do it in time? And what would happen to the children if not? CALAIS CHILDREN: A CASE TO ANSWER follows the young people over the year since they left the Jungle. We speak to Lord Dubs, the volunteer groups, and the lawyers with whom Sue is challenging the Home Office’s actions in the High Court in on 28th Feb and 1st Mar 2018. She goes on supporting and fighting for the kids – with your help. Leeds film showing:. Tuesday 6th March 7.00pm Leeds Beckett University Rosebowl Lecture Theatre D – with local speakers from Stand Up to Racism and refugee groups. The Leeds Coach leaves from outside West Yorkshire Playhouse (Coach turning circle beside the entrance at the top of the steps) at 7.00am and Wakefield Providence Street at 7.15am. We hope to return by 22.00pm . 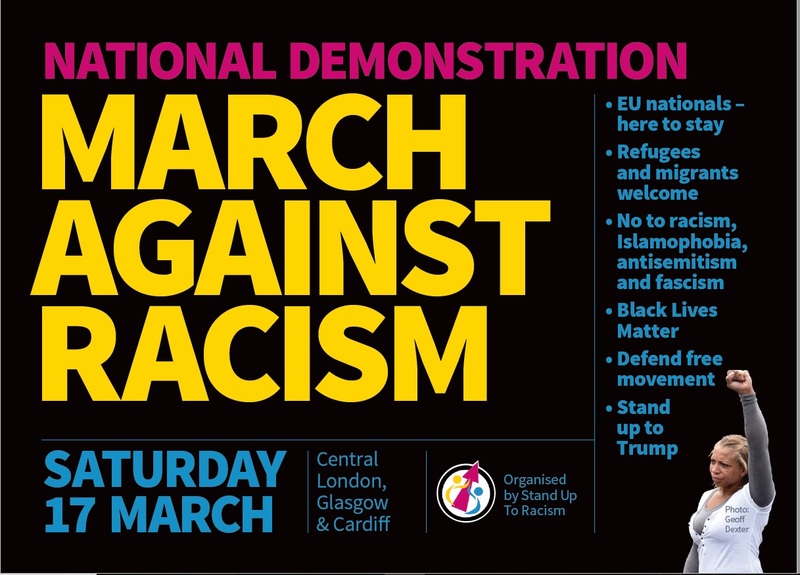 This National Demonstration has been organised by Stand Up To Racism and is part of the UN anti racism day. At a time when Trump spouts racism on a daily basis from the White House and across Europe we see far right and neo nazi parties being elected in many countries it is vital we make this as big a protest as possible.